I did this baby 3 times before posting. These whitish pics are from my 3rd attempt. Took the whole piece of pork to Kampar to chop and feed my roast pork hungry brothers and everybody else who was anticipating this golden crackling pork to arrive. I brought along my camera but I left the memory card behind. I screamed when I found out about my dumbness. This was my nicest layered piece of pork!!!!!! So, in the end, the phone took the pleasure of capturing this prettily layered belly, rind-fat-meat-fat-meat-fat-meat. A special piece from my butcher. Pork is not cheap. So is electricity. And when I want to do this, I want to make sure nothing is missing. There are a few roast pork stalls and shops in Kampar, and at the old wet market area, there are 3 shops. One is quiet, one is popular and the other was so so, cos the pork comes out later in the day and they sell rice with dishes too. Sometimes I buy from the quiet shop, only when I want to do stir fries with that roast pork, cos it's not really that important when the roast pork becomes the supporting actor. But when I want to make the roast pork the main actor for dinner, it's always those from the popular shop. Why such a difference? It's in the taste. The quiet one seems to have something missing. And the popular one seems to have something extra. But actually my all time favourite is the one from USJ Taipan, Nam King restaurant's Chicken Rice stall. It's got even more flavour than the popular shop in Kampar. Which is why when I made this, I made sure nothing is missing. And I sought the recipe with the most ingredients used, cos I don't want mine to be missing something somewhere. Indeed, this is my perfect recipe. I won so much approval from everybody who ate it and they raved and raved about it. I did tweak from the source of recipe by adding in garlic and this is the magic ingredient (and by halving the marinade for 2kg of meat, too salty already!! ), cos I think it'll add a nice touch to it, overall, it's still pretty similiar. The 1st time, I was elated to see it becoming pretty roast pork, but my chopping skills made them look less pretty. Maybe I was impatient and the pork was a bit too warm when I laid my cleaver onto it. Made the amount of marinade, but used only 2kg of pork, too salty!!!! And I didn’t clean my tray after the 1st baking, the 2nd baking with elevated temperature boiled the oil of the pork and made my kitchen into heaven when I opened the door, it was “misty” all over!!!! My house smelt like “urrgghhh” roast pork. My oven was splattered with lard!!! Everybody complained the meat part was too too salty. 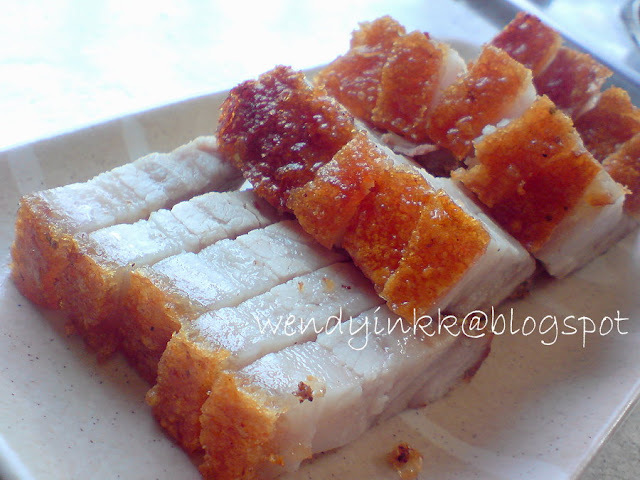 2nd time, was Chinese New Year 2010 and I was in rush to bring the big piece of pork back to Kampar, cos there’re hoards of Siu Yoke fans there and that is after chopping off a small part of it for Mike’s relatives in KK, which are more of Cha Siew fans. This time used the same amount of marinade, and doubled the pork to 4kg, and it was just nice. And because I couldn’t use the same rack I used before,this huge amount cannot turn around on the turntable in my Microwave Convection Oven. I used the grilling rack. I roasted the pork meat side up first for 30 minutes. Turned skin side up for another 30 minutes. (my oven don’t have bottom heat function, it’s either convection or grill, and with the grilling pan, there’s no way the air can circulate, so I had to turn the meat to face the heat. )Then another 40 mins for the skin to char on high temp. My house and oven was clean this time… due to the use grilling rack. Hah.. see, things were there for a reason. The grilling rack was designed that the oil drippings won’t be exposed, but the meat will remain dry. Hence clean oven, clean house. The skin remained crispy for hours, yes you heard me. Hours. I roasted the pork late morning and by dinner time, the skin is still crunchy, meat juicy. (and it was kept in a plastic bag) But please be patient and not chop it until it's totally cooled. Cos when it's warm, when you chop it, the hot juices will definately moisten the crispy skin and make it soggy. You definately won't want your effort to go wasted. Soggy crackling is just urghh!!!! 2kg pork belly, skin on with no bones. 1. 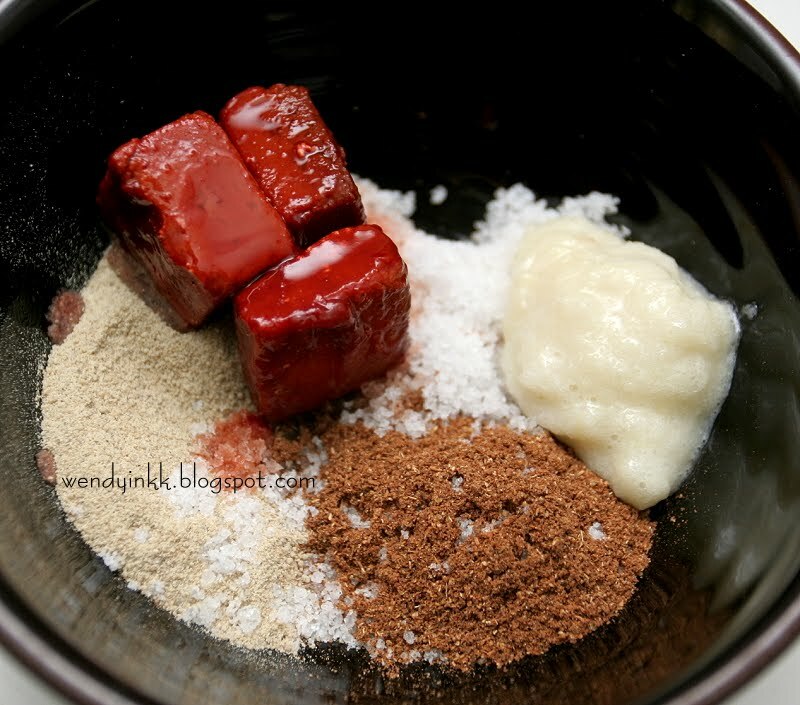 Mix bottom marinade together. Rub the underbelly with marinate, massage into every nook and cranny. 2. 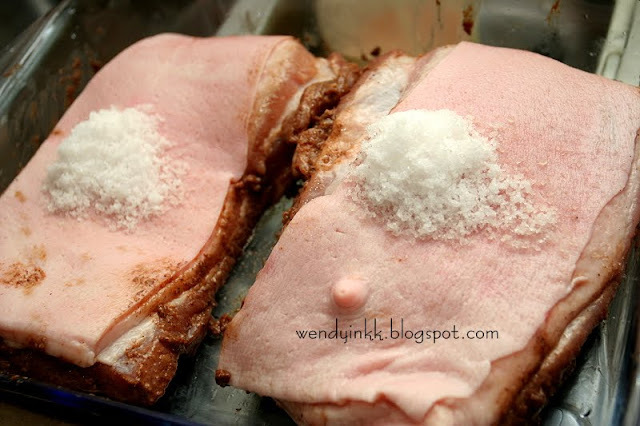 Overturn pork and put on salt. Rub and rub, only on the skin. 3. 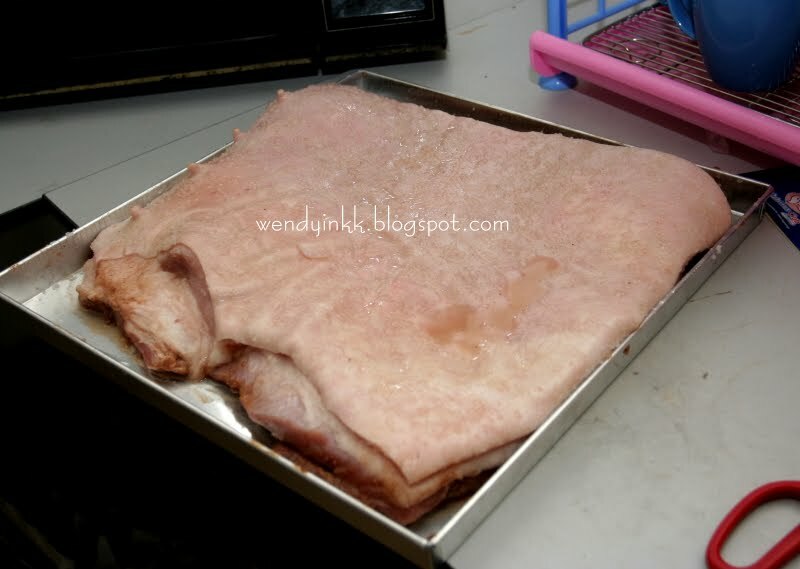 Place pork into the fridge, skin side up, uncovered. Yes, uncovered so that the skin will dry up. 5. Prepare an elevated roasting rack, with a pan underneath. Or just use whatever grilling pan that comes with your oven. 7. 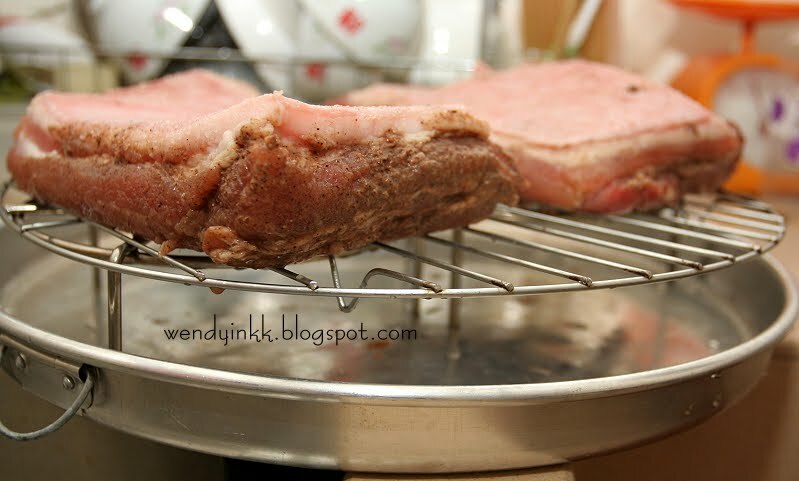 Remove pork from oven, and turn up the temperature to 250C (grill or top heat only). 9. Brush vinegar over pork skin. Change the tray underneath or clean the tray. 10. Return pork(on elevated rack) to oven and bake for another 40 minutes or until the skin is slightly charred. 11. Scrape off the charred bits and leave it to cool down totally before chopping. Forget about it. The pic on the right is how it became after one whack on the skin. The nails were pushed out and the pork skin went unharmed!!!!! That's now how I want it. I want to prick that skin, skin deep!!!! Wow! 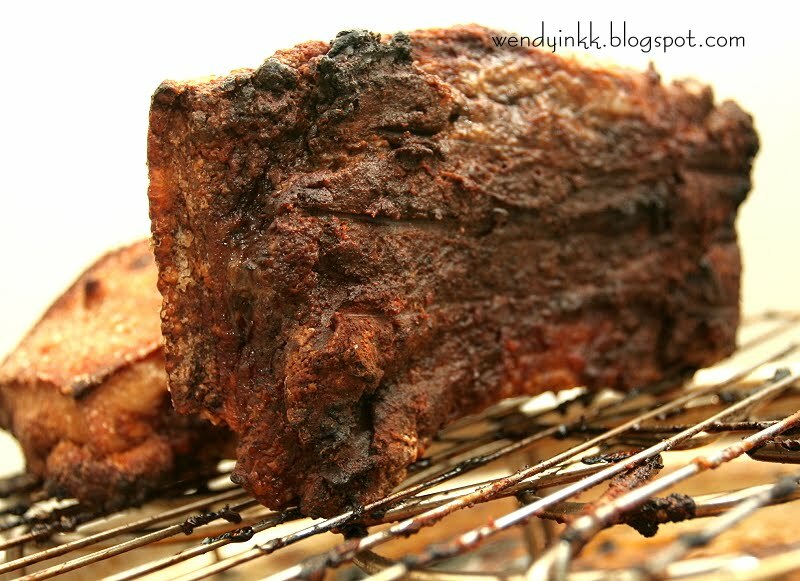 Another tempting yummy roasted pork! Thanks for sharing the step by step photos. Wendy, my husband asking me to bake siew yok for quite sometimes but I am so lazy heeheehee... now you are reminding me to fullfil my promise :P. Your siew yok looks nice, even non fan like me, feel like having some for my lunch :). Wah.. you made your own siew yok! Really impress me! I never think of making it myself :( It looks really PRO!! Better than stall bought! I think you don't have to buy from stall anymore hur!! It's not much cheaper when you make, just taste better and crunchier. i made this once but it was failed due to my old oven can not reached to 220c. I definitely will try your recipe once my new oven is installed. I can see you have a perfect roast pork with perfect crispy skin. well done Wendy! This is so mouth-watering. Your method to prick holes on pork skin is great. For my first attempt, I pricked holes with fork, and I found it's hard. *drools* I tried making this once and the skin was chewy!!! Didn't add fu yu too, must try your method! The high temp is neccessary to get the skin to crackle, if not hot enough, it won't. That's what I heard of pork overseas. Oh no, a fork is not brutal enough. At least a small sharp knife. I hope you try this method next time, rave reviews each time, if not being too salty during my 1st attempt. my favorite! if i'm not watching my weight i would be eating this 3 meals a day! next time when i go over can you please please make this for me??! pretty please! This "siew yoke" looks divine! Nothing wrong with your cutting, they still look pretty! I am very impressed. 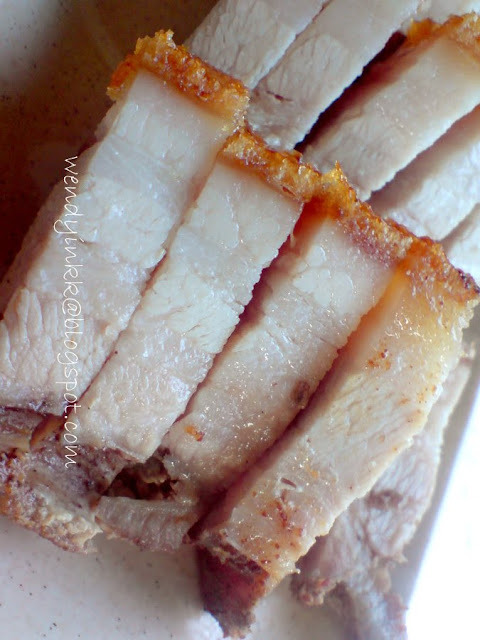 Since I love siew yoke so much, I must give this recipe a go and hope it will turn out as pretty as yours:D Thanks for sharing. 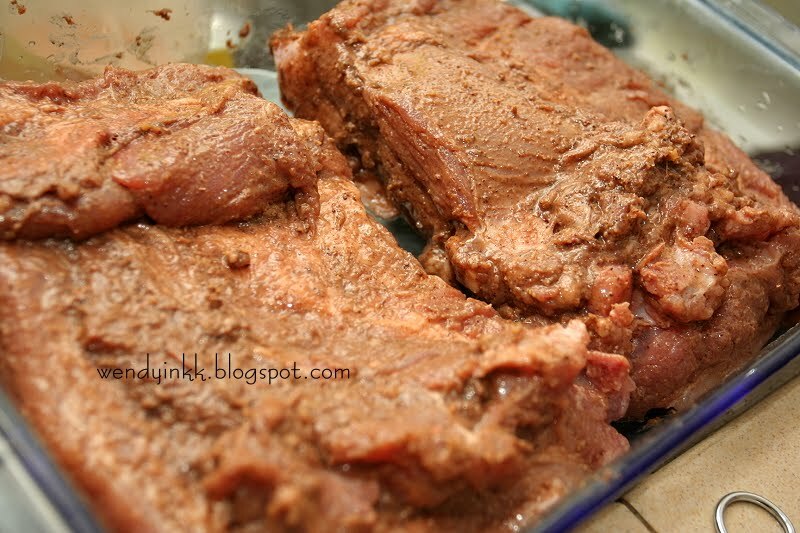 I have my own version of Siu Yoke, but yours is so much better than mine, will definitely give it a try, I'll let you know how it has turned out. I am salivating from your pics!!!!!!!! If your oven comes with a grill pan, use that. It won't splatter that much. I cannot promise as the butcher retire oredi. I'm always lazy to go to wet market, haha. Everybody wants the crispy part, first come first serve lor, no reserving, hahaha. Yours look good also la. I oredi queued this post 4 months ago to be posted this week, haha, and you just posted urs last week. At least urs if fresher than mine, LOL. Do let me know how it turns out if you tried this recipe. Just make sure the oven is hot hot hot!!! Sure, I'd love to know. A real pro at work! Great tips too! Thanks for sharing! What a beautiful piece of roast pork. Make me salivating early in the moring. Since I've know how to make this I never buy from Chinatown again. Homemade taste so much better. One thing though, cleaning up the oven is the hard part because of the oil spatter. I usually roast it with a bit of water on the baking pan. It has been a long time since I last cook roast pork. My alltime favourite! A good post! With water, there tends to be more splattering. Just imagine, hot oil with water. I purposely pour away the juices after the first baking to reduce splattering. Oh I am so drooling over the roast pork! The skin looks so crispy! Just like those I bought from the market! Delicious! I think not easy to poke the skin huh! Wow, this looks really good. I am not a big fan but L loves this so I am going to try this! Wei, you hor just reminded me that this is on my to-try list ... since my days in the States!!! HAHA!! 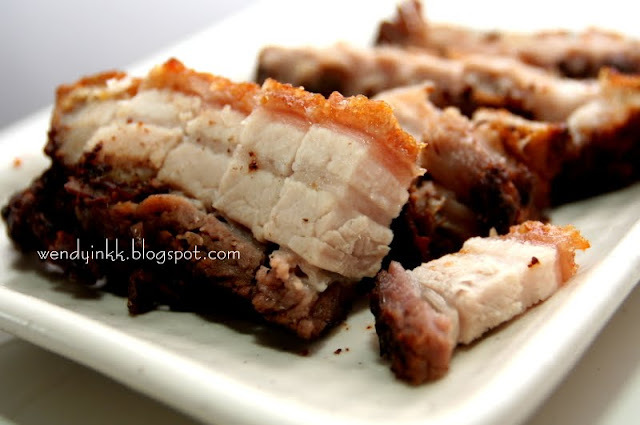 Never get around to make this except char siew ... Sei lor ... 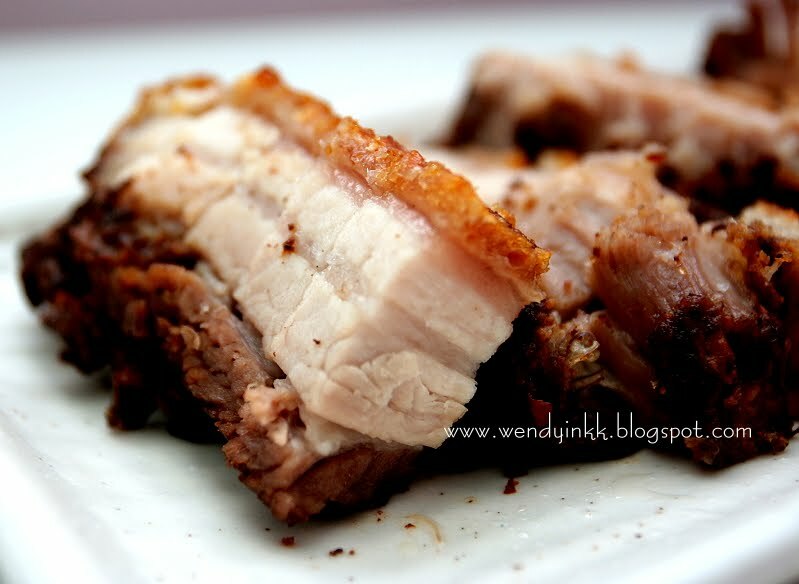 When I have time, I'll make siew yoke lar ... I told you right, my family doesn't consume much pork belly but this is one exception!!! We are suckers for siew yoke!!! Will KIV your post here. Bookmarked as reference! Thank you, dai gah jeh! The skin's pretty tough, the arms felt like doing workout after pricking the skin, or maybe it's just my apparatus being not sharp enough. I tot you don't take pork belly? Well done for such a beautiful roast. Your DIY pricker is so colourful and cute! My list of to-tries from your blog is getting longer and longer, hahah..
Am planning on cooking Siw Yuk again and trying the red fermented beancurd. Its Nam Yu by the way : 南乳. Fu Yu is the white/creamy yellow fermented beancurd. I hope my pork looks as good as yours! 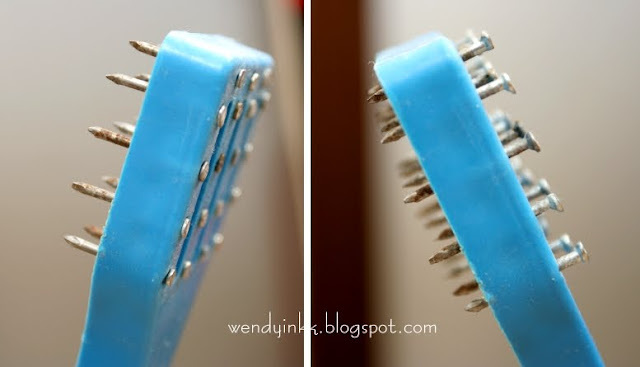 If only I can find the type made with wood, then I don't need to use the DIY pricker. The DIY pricker is quite short, so, have to be careful when pricking the oven hot pork. Thankyou very much for pointing out my mistake. I always get confused with the 2, hahah. I am on holidays at the moment and tried 3 of your recipes the Siu Yoke, fan.....tas....tic and the crackling prefect, Salted Egg Chicken and Tofu from the egg whites - family loved them especially my 3 old year son, he couldn't get enough of the crackling.Thanks again and a Happy New Year to you and your family. Thanks for the recipe. I have tried it.. and its really Good! Except that the pork skin is burnt a little more and the pork meat is not as white as it looks on the pic you posted!!! Thanks! You must let it char a bit, if not the skin won't be tasty. BUT, as said in the instructions, scrape it off. Different farms will give you different meat, I think. Hard to say how the meat inside will look like. I just want to say "What a great job you've done with your website". It's well designed, has lovely photographs ... great selection of recipes. All cook tested too! One of the best foodie sites around, for sure. Really enjoyed my visit & will be back. After instruction no.7, do you discard the salt? I am aimi , living in auckland. I was born in bidor , Perak. Love your blog and thanks for the wonderful recipes that have shared which remind me of my hometown. 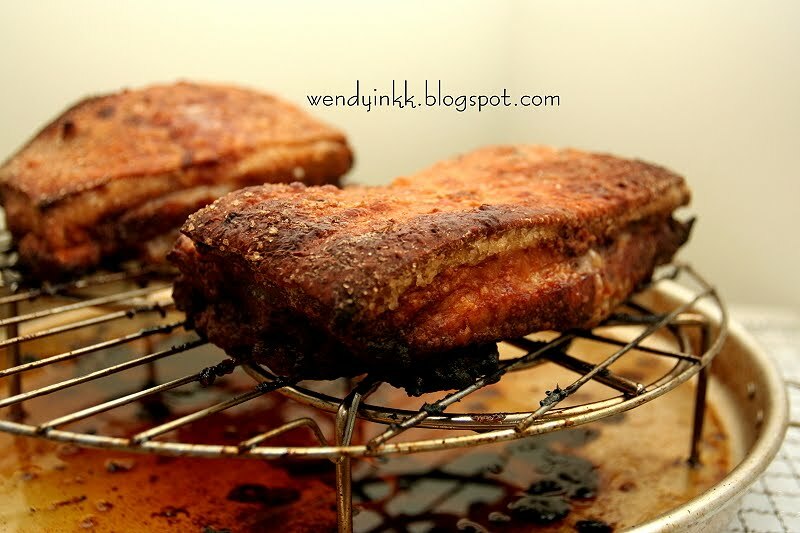 Tried this crispy pork recipe..turned amazing , best crispy pork ever. Just want to say thankyou for the recipe, as I couldn't find a decent restaurant that sells this near my home. And yes, the steaming at the end is essential as you said. It is what rehydrates the less fatty sections of the pork. I learned it the hard way. 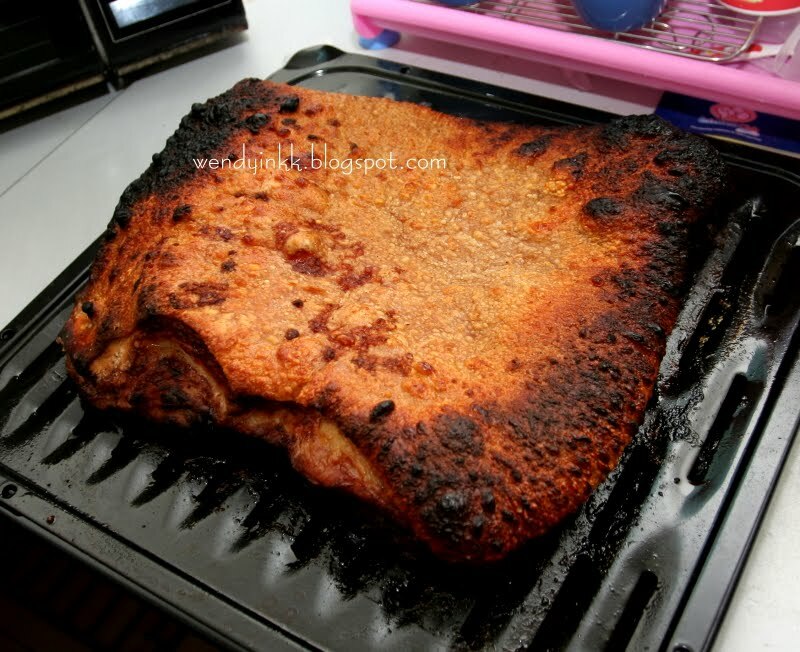 Tried your roast pork recipe. It was so good I made it twice. Thanks for sharing such an awesome recipe. I tried your recipe today, it was awesome! The meat is tender and juicy while the skin is absolutely crispy! Better than outside. Many thanks for sharing. Definitely will make again. Tried your recipe today, perfect recipe! I've been roasting my own siu yuk for years but never stopped trying new recipe. This is the best recipe I've ever tried, my whole family said so too. The skin is crispy while the meat remains so juicy! Pricking the skin and applying the vinegar half way the roasting is the time I've tried too. The other recipes called for applying the vinegar and pricking the skin the night before. This is the best, I finally can stop my recipe searching expedition! Thanks for sharing! the meat marinated in freezer? (top of the ice compartment? 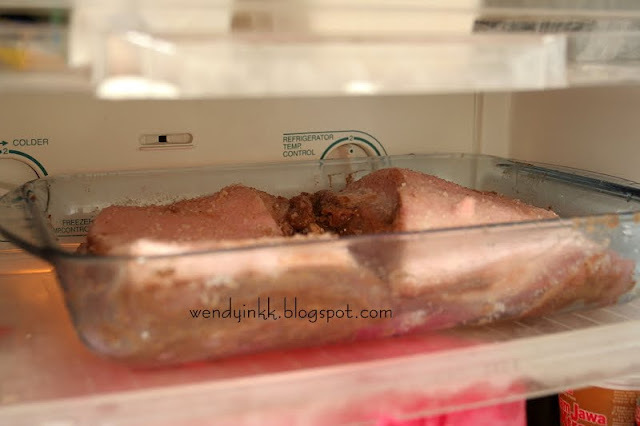 the pork belly need to clean using hot boilling water before marinate? No, as you can see from the pics, the pork is fully raw. Awesome Blog!! Another tempting yummy roasted pork! Thanks for sharing the step by step photos. Hi Wendy! I love your recipes! I have a question for you, do I have to cut down all the marinade if the pork belly is only 500g? Yes you must, reduce it accordingly. Use 25%, cos you used 25% of the pork amount. use water to collect your drippings and then use to make a gravy, its all flavour no point throwing it away. If you're doing this with 1kg pork belly is the roasting time the same? Roast on middle part of oven of upper? Thanks making this for early Christmas dinner this weekend along with roast potatoes & Brussels sprouts. Please reply ASAP thanks! The first roasting, 40 minutes as well, as in the picture, my 2kg pork was split to 2 pieces, 1 kg each. 220C (fan off) or 200C (fan on), middle rack. 2nd part, step 7 onwards, upper racks, to get the skin to char. I can't give you the exact time, you will have to grill or broil it until the skin starts to char. Leek Omelette and Vote for the Winner!! !